British Brexit minister David Davis (L) and EU chief negotiator Michel Barnier address a press conference after their meeting at the European Commission in Brussels on March 19, 2018. The EU’s “backstop” plan for the Irish border remains in the text agreed in Brussels today, despite being angrily rejected by Theresa May when first published. When first proposed in February, Mrs May said “no UK prime minister could ever agree” to the proposal. 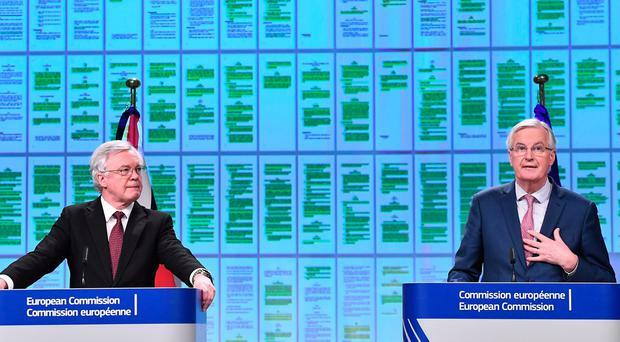 And it is one of a handful of sections of the text released by EU chief negotiator Michel Barnier and Brexit Secretary David Davis not to be marked either green – signifying “formal agreement” – or yellow – signifying “political agreement with details to be clarified”. Mr Davis said he had agreed with Mr Barnier on the need to include legal text detailing a “backstop” solution which was acceptable to both sides​. Mr Davis hailed the agreement as a “significant step” following talks with EU chief negotiator Michel Barnier in Brussels. But Mr Barnier cautioned that some issues remained to be settled, including the thorny question of the Irish border and the governance of the eventual withdrawal agreement. Today Secretary of State, @DavidDavisMP spoke about our agreement on an implementation period with the #EU. Under the terms of the joint legal text agreed by Mr Barnier and Mr Davis, the UK will be able to negotiate and ratify trade deals with outside countries following Brexit Day in March 2019, to enter into force after the end of a transition period lasting until the end of 2020. EU citizens arriving in the UK during the transition, as well as Britons settling on the Continent, will have the same rights as those in place before Brexit Day, said Mr Barnier. The agreement must be approved by EU leaders meeting at the European Council summit on March 22 and 23. This will allow vital negotiations on future EU/UK trade relations to get under way in earnest. Talks will continue on outstanding issues over the summer before a final text of the withdrawal is agreed in October and sent to the European and UK Parliaments for ratification. The pound jumped by almost 1% against the dollar to 1.40 US dollars following news of the agreement. Sterling was trading up 0.7% against the euro at 1.14 euros. Prime Minister Theresa May said: “Prior to December, people questioned whether we would get agreement then. We did. People questioned whether we would get agreement now. We have. Mr Davis said this arrangement would apply only to 2019 and included a guarantee that the UK’s share of the total catch cannot be changed. “Through 2020 we will be negotiating fishing opportunities as an independent coastal state, deciding who can access our waters and on what terms,” he said. Shadow Brexit secretary Sir Keir Starmer said: “This agreement could have been signed months ago but ministers wasted time fighting among themselves, holding out on negotiating objectives that they have failed to achieve and pursuing their reckless red lines. “Labour was the first to call for sensible transitional arrangements because it is the only way to protect jobs and the economy.